Recovery after severe spinal cord injury is notoriously fraught, with permanent paralysis often the result. In recent years, researchers have increasingly turned to stem cell-based therapies as a potential method for repairing and replacing damaged nerve cells. They have struggled, however, to overcome numerous innate barriers, including myelin, a mixture of insulating proteins and lipids that helps speed impulses through adult nerve fibers but also inhibits neuronal growth. But in a new paper, published in the May 23 online issue of Science Translational Medicine, researchers at University of California San Diego School of Medicine report that adult rat myelin actually stimulated axonal outgrowth in rat neural precursor cells (NPCs) and human induced pluripotent (iPSC)-derived neural stem cells (NSCs). 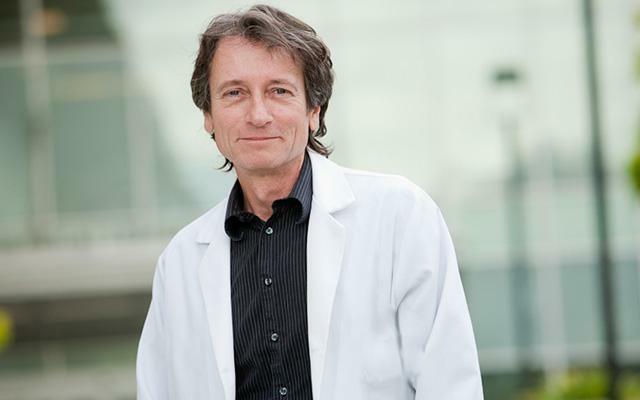 "It's really a remarkable finding because myelin is known to be a potent inhibitor of adult axon regeneration," said Mark Tuszynski, MD, PhD, professor of neuroscience and director of the UC San Diego Translational Neuroscience Institute. "But that isn't the case with precursor neurons or those derived from stem cells." Tuszynski's lab, with colleagues in Germany and Singapore, monitored neurite outgrowth from NPCs and NSCs growing on a myelin substrate in Petri dishes. Neurites are projections from the cell bodies of neurons, either axons (which carry signals outward to other neurons) or dendrites (which receive the signals). In both cases, they found outgrowth enhanced threefold. In subsequent studies using rats with spinal cord injuries, the researchers found that rat NPCs and human iPSC-derived NSCs implanted at the injury site both extended greater numbers of axons through adult central nervous system white matter than through gray matter, and preferentially associated with rat host myelin. Paring away some of the myelin molecules known to strongly inhibit axonal growth, Tuszynski and colleagues identified a molecule called reuronal growth regulator 1 or Negr1 as a potential mediator between axons and myelin, permitting the former's growth. Negr1 is involved in the process by which cells attach to neighboring cells and interact. The growth factor plays an important role during embryological development, when neurons are growing rapidly but before myelin begins to have an inhibitory effect. "When we implant neural stem cells into sites of spinal cord injury, they extend tens of thousands of axons out of the injury site for distances of up to 50 millmeters," said Tuszynski. "Adult axons on the other hand, when coaxed to grow, extend 100 axons for a distance of one millimeter. These findings identify why axon outgrowth from neural stem cell implants is so much better than injured adult axons." The findings support the developing approach of using neural precursor cells and iPSC-derived stem cells as a viable and promising method for repairing spinal cord injuries, wrote the study authors. More specifically, they point to the need to further investigate the stimulatory effects of myelin on NPCs and NSCs, which "could potentially be exploited for neural repair after spinal cord injury." Co-authors include: Gunnar H.S. Poplawski, Richard Lie, Matt Hunt, Hiromi Kumamaru, Jacob Robins, Philip Canete, Jennifer Dulin, Cedric Geoffroy, Binhai Zheng, and Grace Woodruff, UCSD; Riki Kawaguchi and Giovanni Coppola, UCLA; Paul Lu, UCSD and San Diego Veterans Administration Medical Center; Michael Schafer and Lutz Mensel, Johannes Gutenberg University, Mainz, Germany.